Here is one of the easiest way to populate Favorites in Internet Explorer using Microsoft group policies. 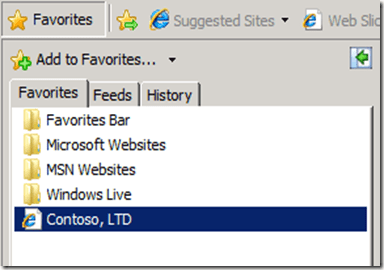 Using Group Policy to populate the favorites in Internet Explorer allows you to make sure your users have quick access to mission critical websites. To do this, create or use an existing GPO that is properly scoped to the users you want to publish the links to. In Group Policy Manager right click the GPO and click Edit. Provide a name and a URL. You can even provide the location for a custom icon for the site. Once you are finished, click OK in the Favorites and Links window. Close the Group Policy Management Editor to save the policy. Refresh the Group Polices on a client and test. Should the user delete this link, it will re-appear at the next Group Policy refresh.